Unimog derives its name from UNIversal-MOtor-Gerät, or universal motor equipment. Today's Nice Price or Crack Pipe 404S flatbed could haul lots of motors and equipment, but will its price make it UNIversally loved? Orem Utah's DASTRUP AUTO INC is a gift that keeps on giving, and while 85% of you felt their 2005 Renault Clio had too much baggage to warrant its price, today's Mercedes Benz could carry all of that, AND the Clio. You know what names strike fear into the cold, dead hearts of zombies? Pinzgauer, and Unimog that's what. That's because when confronted with something like today's 1967 Unimog 404, they quickly come to the realization that their dinner reservations have been permanently cancelled. Being pretty much vegetables themselves, zombies especially hate the Unimog for its somewhat Vegan roots. You see after its drubbing in WWII, Henry Morgenthau proposed that post-war Germany transform itself into a peaceful agrarian state. Daimler Benz, seeing an opportunity not to have all its valuable tooling taken from them through the Marshall Plan fire sale, began the development of a specialized agricultural vehicle - sort of like a cross between a tractor and a four-by-four, along those lines. The resultant U 25 production model debuted in 1949, and in 1953 Mercedes welcomed the truck into the family by allowing it the right to wear the venerated three-pointed star. Farmers loved the Unimog, as did the occupying French Army forces, who bought 400 of the initial military version. The 404S model first appeared in 1955 and was the first Mog intended more for truck duty than tractor. Initial orders for these models again went to the French, who obviously have always been ahead of the game in preparing for the zombie apocalypse, or perhaps they just wanted to stay on the Germans' good side. This ‘67 Unimog features what at first appears to be cammo paint, but which upon closer examination looks just to be sporadic application of primer over its desert tan base coat. There's not much to paint here, the Uni's cab being little more than a place for the grille and headlamps, and some doors cut lower than an exhibitionist's jeans. Behind that is a flat, open bed that is rife with transporting possibilities. Power is provided here by what is claimed to be a rebuilt engine, and which should be the 2,195-cc 82-horse Mercedes 180 six cylinder. These were basically standard Benz engines, so parts aren't that hard to find, but there is a unique sump with special locating struts that help keep the driveline in vertical alignment, and that's supposedly a mandatory fitment. The gearbox is also said to have been renewed and the whole ball of wax only has 14,000 miles on its clock. It also has 40-inch off-road-ready tires and 18-inch ground clearance so, should you like to stay high and dry on your extra-tarmac adventures, you could do a lot worse. The rest of the mechanical features noted in the ad - axles capable of 40-degree articulation; 6-on and 6-off road gears; onboard air compressor; and a 2-speed reverse - reads like 50 Shades of Grey for Tim Allen. Ooh-ooh-ooh, ahh-ahh-ahh! 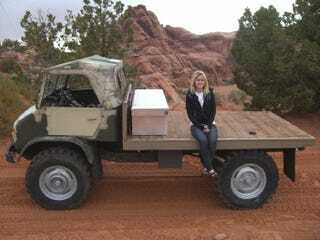 Real world use of a Unimog - especially a flat bed canvas topped one like this - are naturally limited. I mean you can't very well shuttle the soccer team to Round Table after a game in it. That is, unless you were to turn it into a stakebed. . . Hmmm, maybe this is adaptable to the real world - just not the freeway, what with its 52 mph top end - and what can't be adapted to can probably be mowed over considering the plethora of gear options and ground clearance. So, we know that we all want a Unimog, the question for today however, is whether or not someone should pay $19,950 for this particular Moggie. What do you say, is that a fair price to pay for the potential of zombie protection and general bad-assetry? 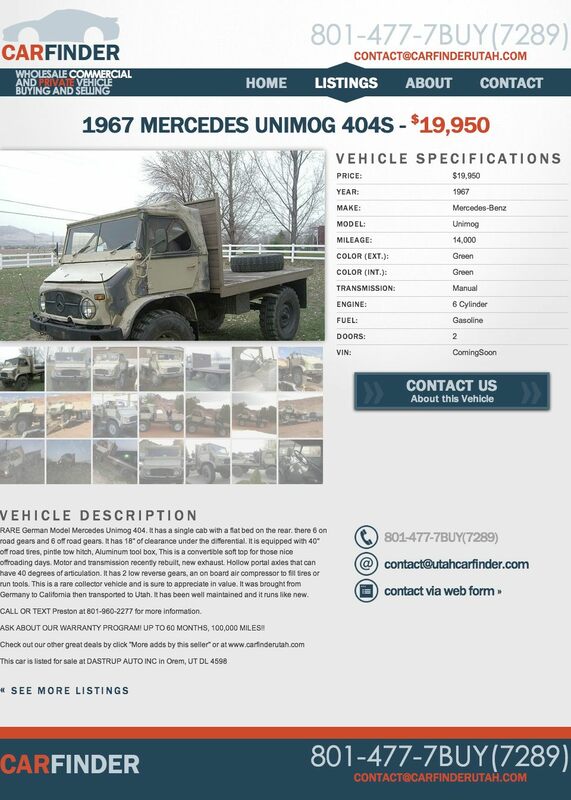 Or, does that price make this an Un-wanted Unimog? Car Finder Utah or go here if the ad disappears.